The City was a railroad town for decades, with the railroad employing up to 1,225 people by 1929, out of a population of only 6,425 people. With the onset of World War II the rail yards became busier than ever, and the post-war building boom brought continued prosperity. However, the nature of the City changed dramatically in the 1950s. During the 1950s the railroad continued to expand and upgrade, converting its steam engine fleet to all diesel engines by the end of the decade. However, the railroads began falling in the shadow of air travel and the development of the national Interstate Highway System. Thus, although the railroad remained (and still remains) a major employer, the expansion of the City began branching out into other employment sectors. Another important change during this period was the Washington Boulevard (then called Seawell) railroad underpass construction in 1950. While this improved the ability of people to travel from one side of the tracks to the other, it meant that people were no longer traveling through the Roseville business district north of the tracks. The completion of Interstate 80 in 1956 shifted the population from downtown to what would become known as East Roseville. The old downtown area slid into a gradual decline. The City saw steady population growth throughout the ensuing decades, as shopping centers, major retailers, and homes were constructed throughout the City. The growth rate was modest until 1985. Between 1929 when the population was 6,425 people and 1985, the population grew by only 22,563 people. In 1985 the population stood at 28,988 people. Five years later it was 44,685 people, and by the year 2000 it was 74,234 people. Some of this growth was fueled by the location of major employers, such as Hewlett Packard (in 1979) and NEC (in 1983). The population as of 2014 is 126,956 people. 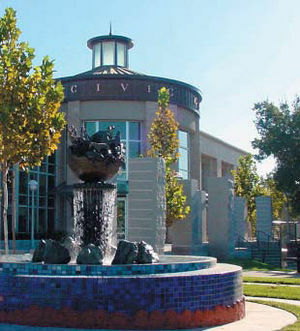 While the character of Roseville has changed over the years, as the City grew from its small-town beginnings to its status as a major urban city today, it has retained some of its historic beginnings. Roseville is no longer a railroad town, but the Union Pacific Railroad is still the 6th largest employer (see Major Employers section, below). Current visitors can now visit the revitalized historic Vernon Street and old Downtown areas which had been in decline for decades, but were recently rehabilitated.